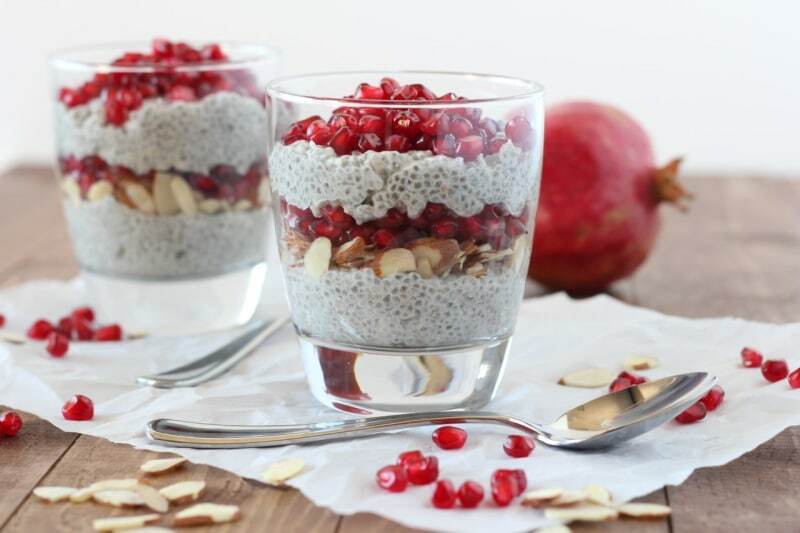 This beautiful pomegranate and almond chia parfait will delight your tastebuds and beautify your breakfast table! 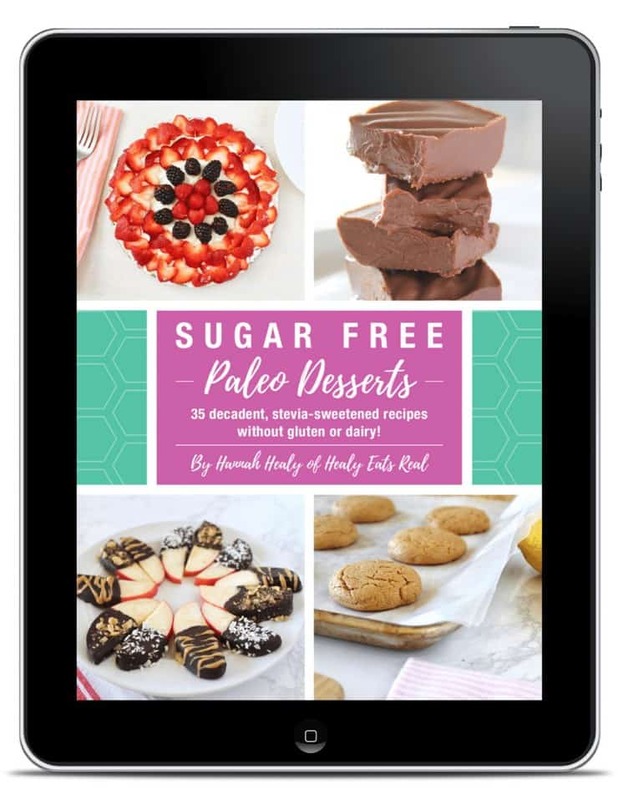 It's a healthy paleo, grain-free and dairy-free alternative to regular parfaits. I’ll admit that I sometimes get a little parfait-envy on weekend brunches. My friends can always order these beautifully constructed parfaits, which are typically off-limits for me. Either because they’re not gluten-free or grain-free. So I wanted to make something that was not only healthy and delicious…but beautiful! 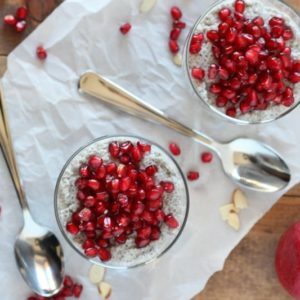 So why is chia so good? It’s loaded with antioxidants and fiber. It’s also high in plant-based omega-3’s and full of nutrients like calcium, phosphorus, magnesium and protein. Lots of good stuff. 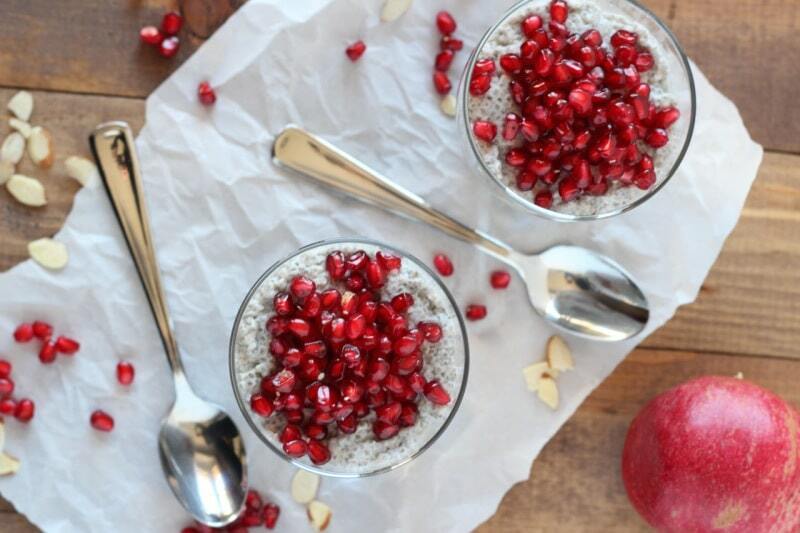 Add the pomegranate which is touted as the most powerful antioxidant of all fruits (with immune supporting benefits)…and I’d say you have a darn good breakfast. Now, I know we’re only in November…but doesn’t this just look like a perfect Christmas breakfast? I think so. And I LOVE how ridiculously easy it is to make. Mix the coconut milk, chia, maple and vanilla extract together in a bowl. Stir or whisk until well combined. Cover and place into the refrigerator. (*This is best done overnight, but can be done during the day with a minimum 4-5 hours of refrigeration). Remove the chia mix from the refrigerator and dollop a few large spoonfuls between two glasses. Divide the slivered almonds on top, then some pomegranate seeds. 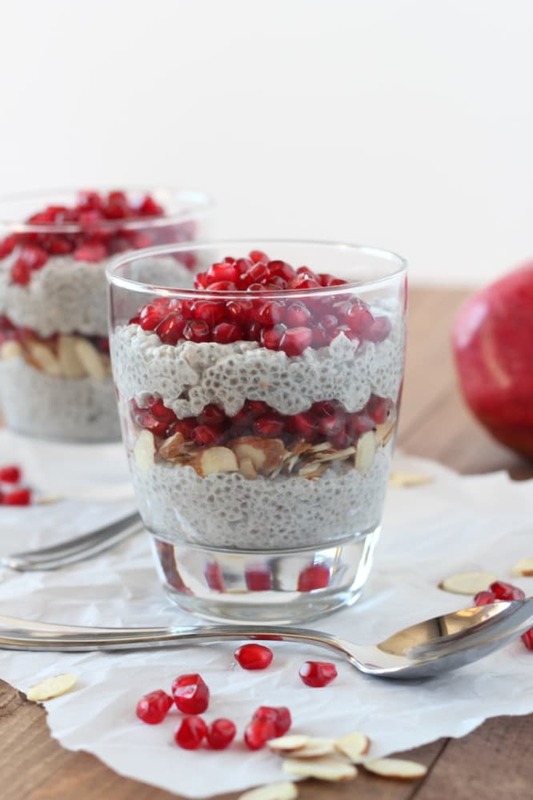 Dollop the remainder of the chia mix in the glasses, followed by the rest of the pomegranate seeds. 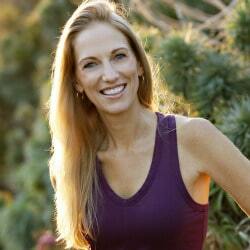 Lisa Bryan is a writer, wellness warrior, explorer and motivator for vibrant living. She believes that wellness is a journey and simplicity is not boring. After being diagnosed with four autoimmune diseases in two years, Lisa became an impassioned advocate for health and lifestyle transformations. 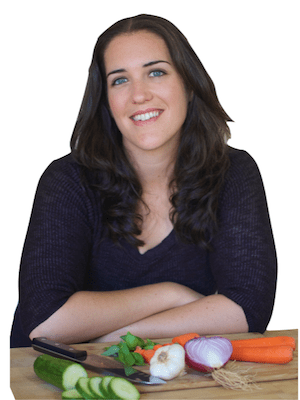 Realizing that stress, poor diet and lack of sleep were triggering disease on a grand scale, she left her former life as a biotech marketing executive to start Downshiftology. Today, Lisa inspires countless women to restart their lives, take action for positive change and make each day count. Connect with Lisa at www.downshiftology.com and Facebook, Instagram, Pinterest, and Twitter. I just mixed this up for breakfast in the morning, but I used regular milk. I haven’t used chia seeds much so I hope this works. Can’t wait to see. 🙂 Thanks for posting! !